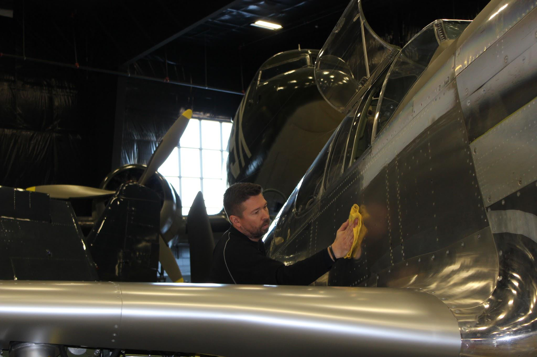 A November roadtrip with a van full of coworkers offered the opportunity for me to sprawl out on the floor of the Flying Legends Hangar at the Dakota Territory Air Museum to write a section of our company’s 2017 annual report. The Saturday morning clamor of a bustling children’s museum was to my right, while a remarkable collection of warbirds was lined up on my left; the combination effected a perfect salute to the Texas Flying Legends Museum’s dedication to “honoring past generations and inspiring the leaders of tomorrow through active display of WWII warbirds.” What better place to reflect on the year and our team’s reason for existing? 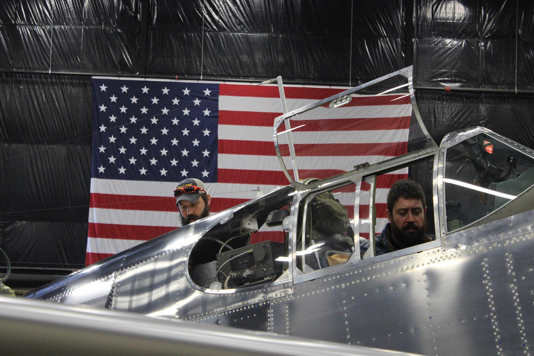 Members of the AirCorps team were there to give Lope’s Hope 3rd a bit of attention following her first flight in Bemidji, MN, a trip to Houston, TX, for the Wings Over Houston Airshow, and then the return to Minot, ND. 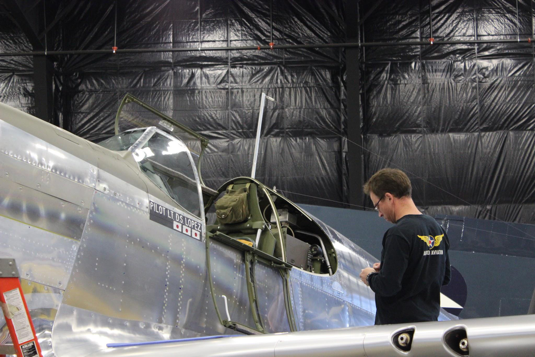 Erik Hokuf (AirCorps Aviation), and Warren Pietsch (Texas Flying Legends), discussed details related to the Mustang’s upcoming 2018 airshow season. Randy and Sam judiciously scrubbed bugs off the leading edges with microfiber cloths and glass cleaner. Tye and Ryan installed a couple custom-fabricated brackets while Denzil completed some additional wiring. 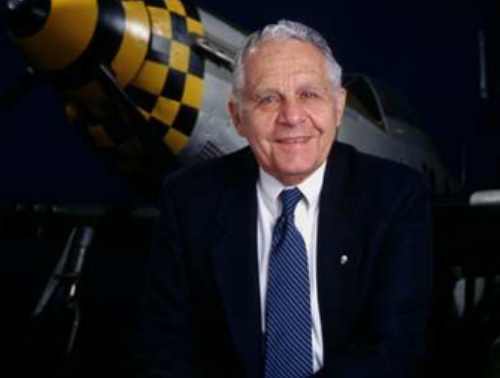 “Honoring a WWII combat pilot’s war time service is an important motivation to restore a warbird, but the reason Texas Flying Legends Museum specifically chose Donald Lopez’s color scheme had to do with his dedication to those with whom he had served in China. 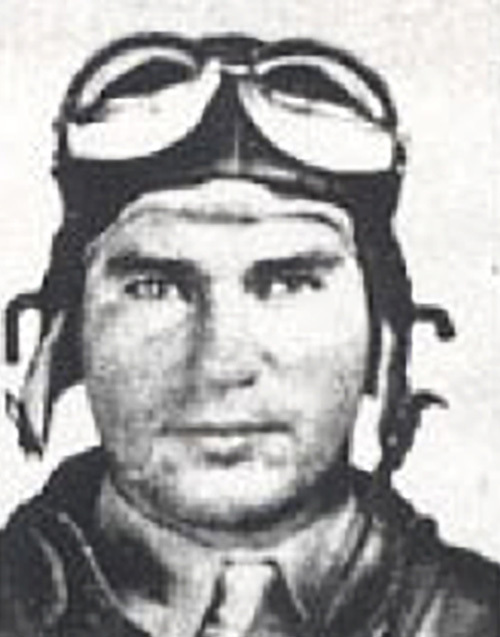 Another member of the 75th Fighter Squadron, Oswin “Moose” Elker, was from Surrey, North Dakota. 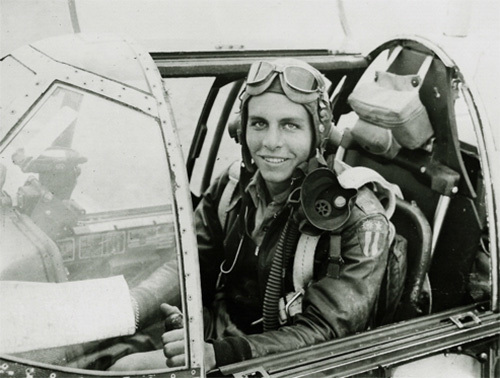 Moose and Donald not only flew together in the 75th Fighter Squadron in China, but also were in the 337th Fighter Replacement Training Unit at the same time. 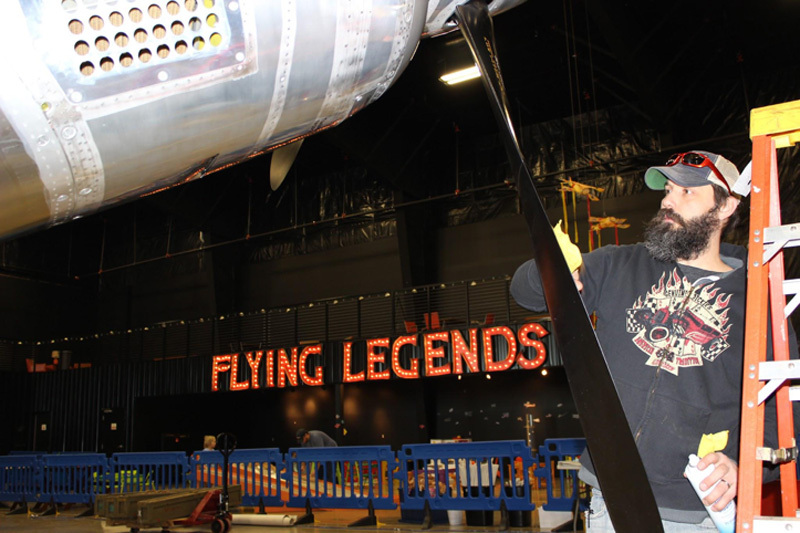 In the hangar, the exposed bulbs of a vintage-style sign illuminate “FLYING LEGENDS” as adornment to the mezzanine that provides a spectacular view of the arrayed aircraft. 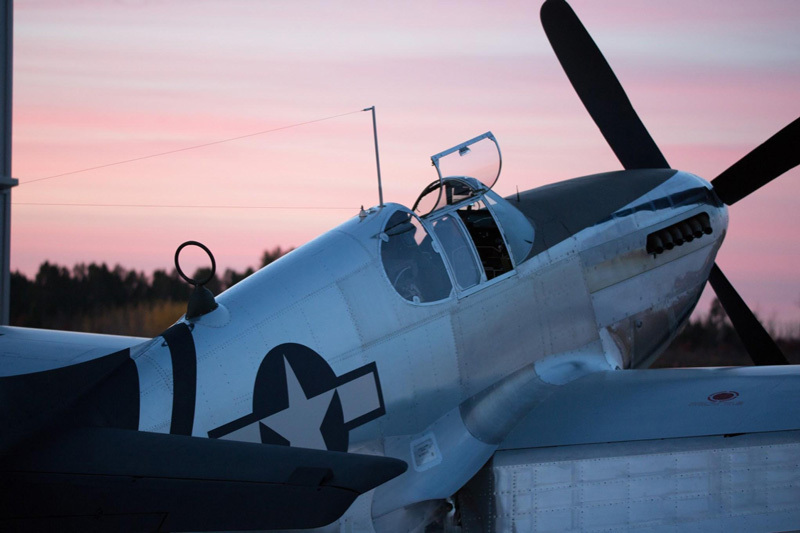 The capacity for people to come together to create an airworthy memorial to “flying legend” Don Lopez was certainly highlighted when the fully restored Lope’s Hope 3rd took off in October against the colorful backdrop of a near-sunset sky in Bemidji, MN. 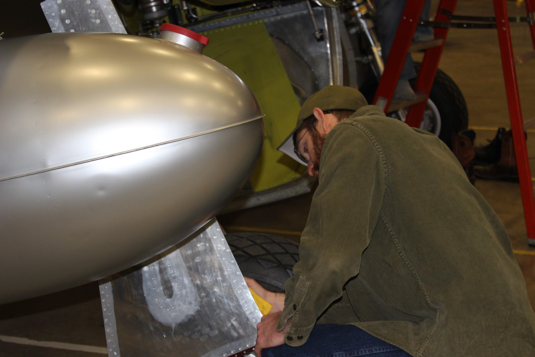 Thanks to people like Warren Pietsch (who let me sit in a Spitfire AND a C-53! 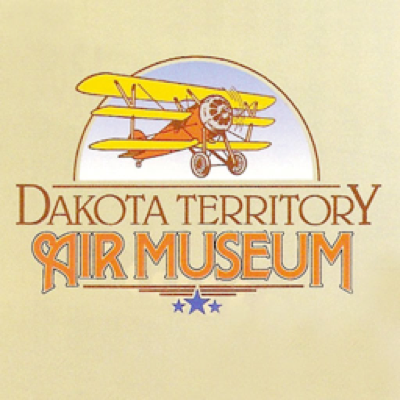 ), the people I traveled with, and all those who contributed to the museum over the years, a weekend visit to North Dakota will call to mind the purpose of our work for a long, long time. 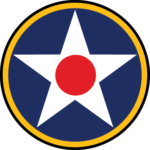 My name is Roland Franks, and Oswin “Moose” Elker was my great uncle on my mother’s mother’s side of he family. I visited my great uncles home in Rochester, MN once when I was much younger and remember him showing us (me and my siblings) a few things from his days in China. I now live in Kunming, where I teach at an international academy. The elder of my two sons, who was born in the year of the Tiger (2010), is named Oswin “Xiao Hu” (Little Tiger) Franks, in honor of his great-great uncle’s participation in freeing the Chinese people from their Japanese aggressors during World War II. I have read Lopez’s “Into the Teeth of the Tiger” and occasionally share with my students the image of Oswin “Moose” Elker printed in Lopez’s memoir. When I present to local people my family connection with my great-uncle, telling people what he was a part of, the older citizens thank me, to honor his role in their lives. 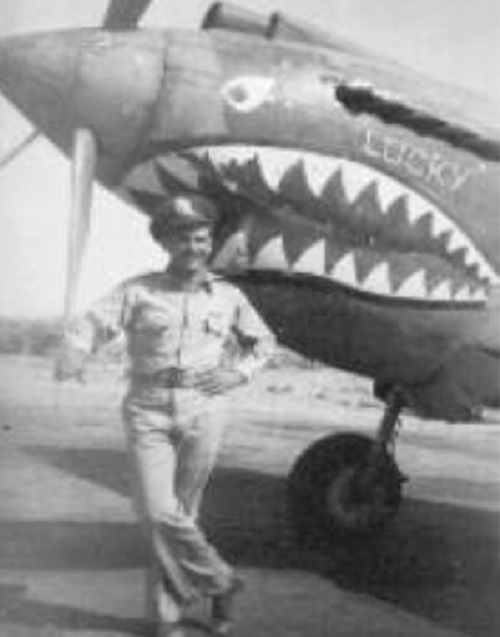 While younger citizens may not feel that same connection, they still know the 飞虎队–The Flying Tigers–and what all the pilots mean to the history of the area.